Polysafe safety flooring from UK manufacturer Polyflor was recently used to help return Lido Ponty, the National Lido of Wales in Pontypridd, to its former glory as part of Rhondda Cynon Taf Council’s £6.3m restoration project. Lido Ponty is a Grade II listed lido, originally built in 1927, which has now been transformed into a modern outdoor pool and adventure play park by main contractors Kier Construction. 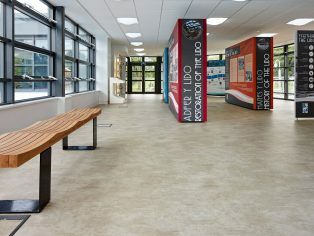 The Polysafe Arena PUR and Polysafe Modena PUR safety flooring ranges which offer sustainable slip resistance in accordance with HSE guidelines were installed by flooring contractors CS Flooring Solutions at Pontypridd’s new visitor attraction. Suitable for busy commercial environments where there is a high level of footfall, Polysafe Arena PUR in the Cement design was installed in The Waterside café and the visitor centre where the lido’s rich heritage is showcased, whilst Polysafe Modena PUR safety flooring in the Blue Quartz and Andesite shades was used in back of house zones and the centre’s busy reception area. Both of these design-led safety flooring ranges incorporate clear aluminium oxide safety particles through the performance layer of the vinyl which are virtually invisible to the naked eye, ensuring an attractive yet safe floor finish for use in commercial or residential areas. The Polysafe Arena range replicates on-trend stone, textile and abstract designs whilst the Polysafe Modena collection features a sophisticated micro-granite decoration in a selection of neutral and bright shades. Like all Polysafe ranges, Arena and Modena meet slip resistance requirements, achieving 36+ on the Pendulum Wet Test with full conformance to HSE Guidelines and EN 13845. These two ranges also pass the 50,000 cycles abrasion test demonstrating the sustainability of slip resistant performance. The Polysafe Arena and Modena ranges are also enhanced with Polysafe PUR polyurethane reinforcement which is cross linked and UV cured so these floorcoverings can be easily maintained with a simple cleaning regime, providing optimum appearance levels and reduced life cycle maintenance cost savings. Manufactured in the UK, Polysafe safety flooring contains recycled material and is 100 per cent recyclable via the Recofloor vinyl take back scheme. 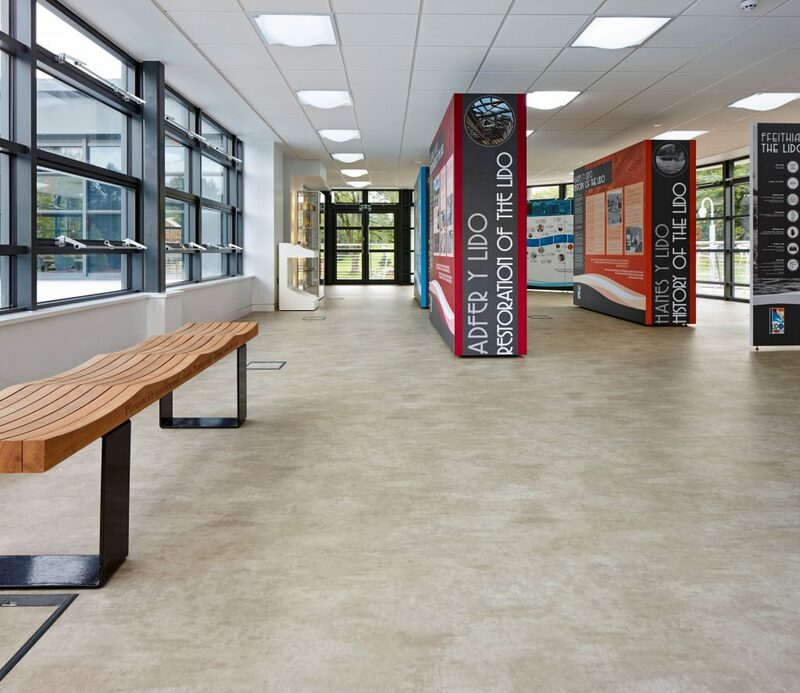 The sustainability credentials of Polyflor’s flooring are supported with the award of BES 6001 Responsible Sourcing Standard and certificated BRE Global A+ ratings for many ranges. Samples from any of our safety flooring ranges can be ordered free of charge on the Polyflor website or by calling the Polyflor Samples Direct Hotline on 0161 767 2551.